Product #1318 | SKU CONVOPENGCAUDS | 0.0 (no ratings yet) Thanks for your rating! 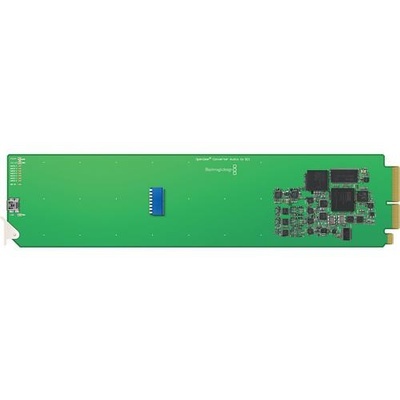 The Blackmagic Design CONVOGCAUDS includes everything you need to embed 4 channels of analogue audio or 8 channels of AES/EBU digital audio into any SDI video connection. Embed audio from audio mixers and analogue decks into SDI video connections for use with SDI routers and decks, or to add extra audio channels to video convertors! Blackmagic OpenGear Convertors are fully compatible with the OpenGear standard. OpenGear is an open standard for rack mount convertors and processing for television broadcasters. OpenGear uses a 2 rack unit rack frame that holds up to 10 plug in cards, or a double density frame can be used to hold up to 20 cards. Many manufacturers develop OpenGear cards and frames that can be mixed and matched. OpenGear cards are hot swappable and can be controlled by java based DashBoard network control and monitoring software on Windows, Mac OS X and Linux. Blackmagic OpenGear Convertors feature 24 bit analogue and 24 bit digital audio. You can select either analogue or AES/EBU digital audio via mini switches, or remotely via the DashBoard network control software. Blackmagic OpenGear Convertors will then switch to use either analogue or AES/EBU digital audio. Blackmagic OpenGear Convertors support the standard 2 ch and 4 ch audio rear modules, so they can be used with other brand OpenGear products. Blackmagic OpenGear Convertors are built to the highest quality standards with low SDI jitter. You get the longest SDI cable lengths combined with ultra low noise analogue video and audio for a true broadcast quality solution. Blackmagic OpenGear Convertors are similar, so they're easy to understand. With advanced 3 Gb/s SDI technology, every card is fully compatible with all your SD and HD equipment, plus you can update new formats via USB. Blackmagic OpenGear Convertors can be set up via mini switches, DashBoard, or via USB using Blackmagic Design's Convertor Utility. That's three completely different ways to configure, so you're never stuck in a critical live situation. With the latest 3 Gb/s SDI technology built into Blackmagic OpenGear Convertors, you know you're getting the latest technology. New standards can be uploaded via the USB port. 3 Gb/s SDI is also fully compatible with all your SD and HD equipment.